Sunday morning we woke up in a St. Louis suburb and continued east. We’d told our people about the Gateway Arch, and our little pilot-in-waiting was super excited to get so high up and see out the windows. We went online and got 11:20am lift tickets, which between drive time, parking, and construction in the Arch Park, ended up being perfect. 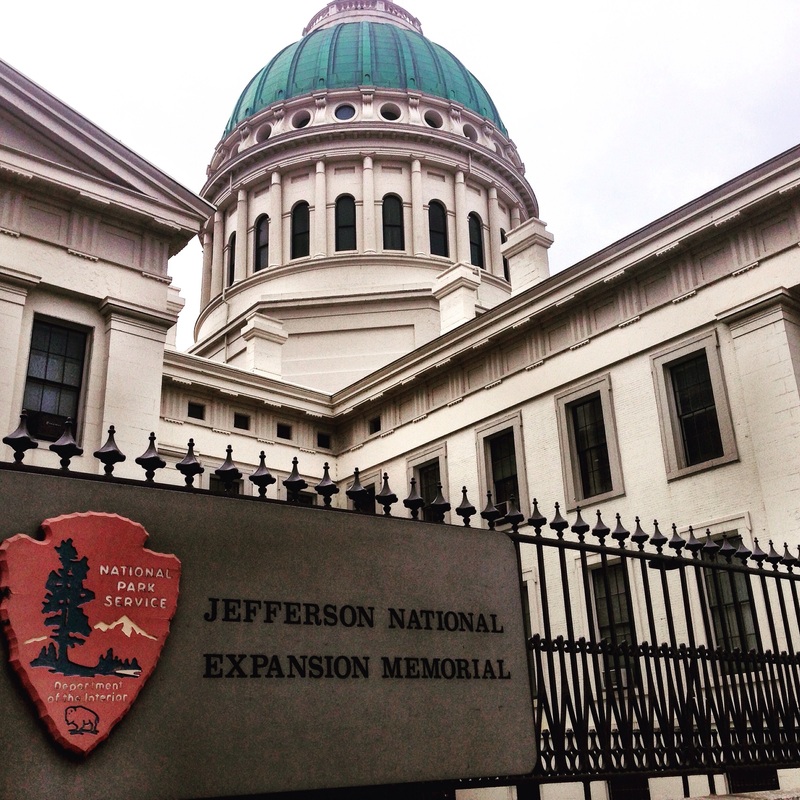 We visited the Jefferson National Expansion Memorial in the old federal courthouse, where the Dred Scott case was heard in 1856 and decided in 1857. The rotunda of the courthouse was magificent, and our pioneers enjoyed stamping their official U.S. National Parks Passport with three stamps — the Jefferson Expansion Memorial, the Gateway Arch, and the Lewis and Clark Expedition. 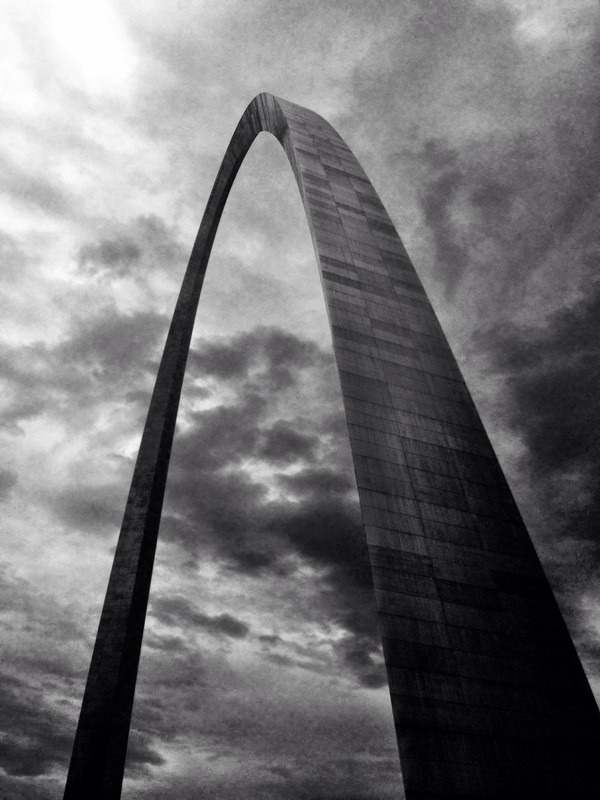 The arch itself is 630 feet tall, with 16 windows on each side, each 7 inches tall by 27 inches wide. Situated on the original founding site of the City of St. Louis on the west bank of the Mississippi River, it was built over the course of two and a half years in the early 1960s and opened to the public in 1967. The arch was designed by a Finnish-American architect and a German structural engineer, and is meant to signify an actual “Gateway to the West” and serve as a monument to the pioneering spirit of those who went West and Americans who continue to pioneer in other ways. This sentiment of course made me love the Gateway Arch in a way I didn’t know I needed to before. 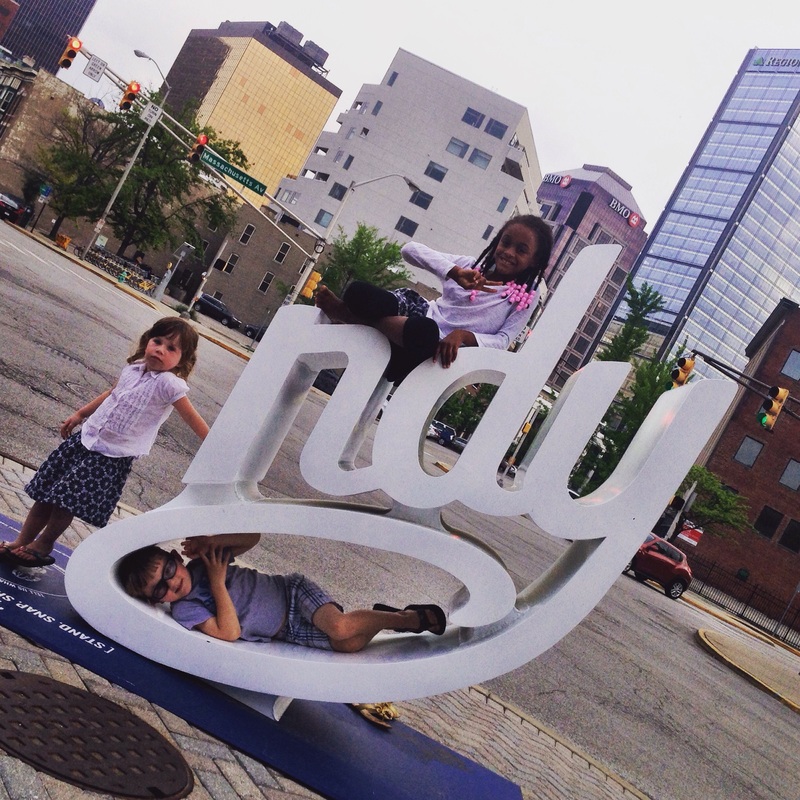 We had plans to have dinner with friends in Indianapolis tonight, so after the arch it was time to jump back in the minivan and keep driving. We passed through southern Illinois (state seven! ), popping into Kahuna’s Burgers in Greenville for a quick snack on the road. 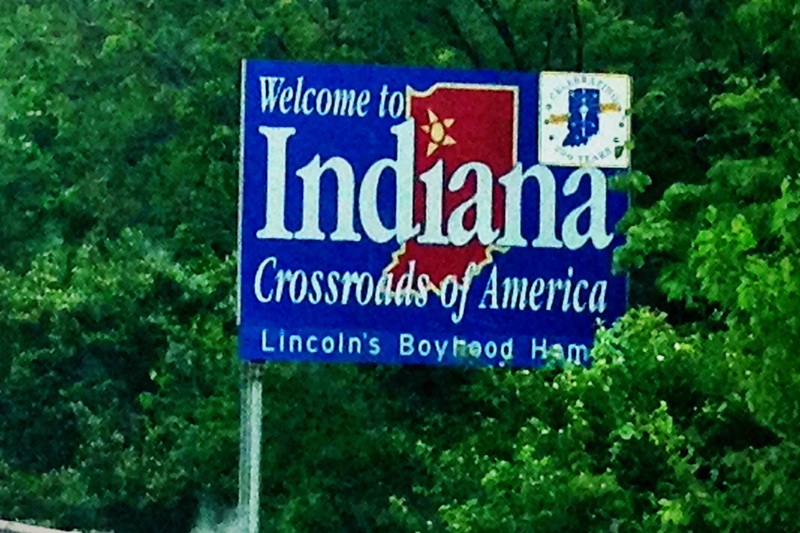 About two hours later we crossed the state line into Indiana (state eight!) at Terre Haute. Then an hour after that we navigated our way to the delicious Bru Burger to have dinner with our friends who moved to Bloomington last year. 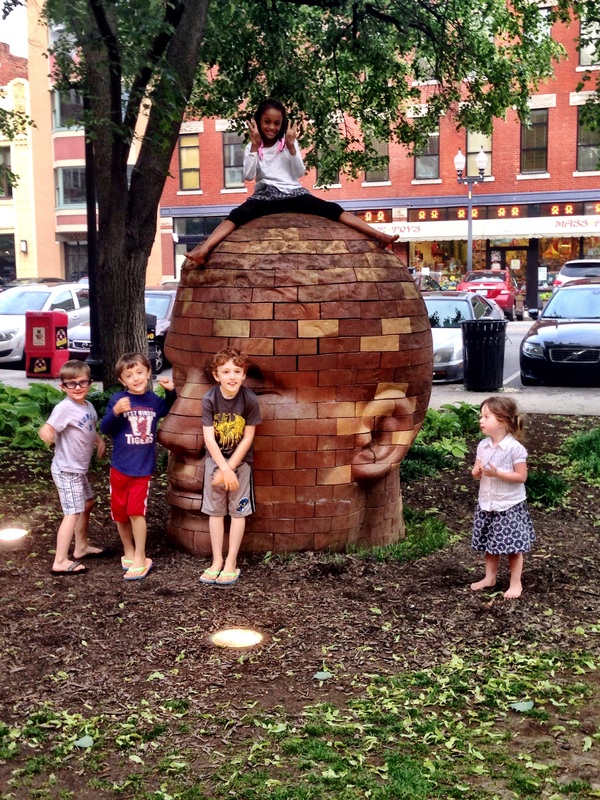 After dinner the kids needed to play, so we went out to a small grassy area where they climbed on this head and danced with Ann Dancing and had their photo taken with the “ndy” sign. We sent our friends back to Bloomington that night, and they sent us to our hotel room with delicious Corporate-to-Cupcakes cookies and cupcakes. It’s Eastern Daylight Time in Indiana, which means we are three hours off Arizona time, and it doesn’t get dark in Indianapolis until after 9pm. Since that’s only 6pm Arizona time, we decided to embrace the sunlight and let the kids stay up late. Say a prayer for us that this also means that they’ll sleep later in the morning!